Well known as a prolific contemporary visual artist in Northern Europe, New York City and Hong Kong, Kenneth Blom was introduced to Berlin by Maerz Contemporary for the first time in 2011. 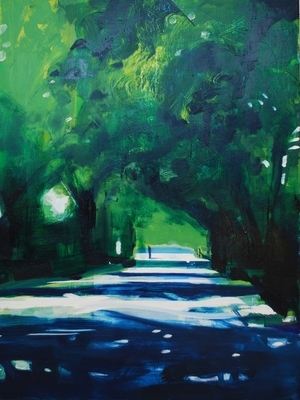 Then as now (2016), Blom's paintings can typically exude both a gleeful brightness and strange dystopian coolness in their hues of electric blue and green in which he depicts serene landscapes or modern architectural settings often peopled by a solitary figure or two. His realistic outdoor scenes have a surreal quality that suggest a hidden melancholy revealed by the penetratingly bright Northern sun. The recurring pool scenes in Blom's work bring to mind Hockney's California-bred alienations while at the same time introducing a keener emotional quality. His indoor scenes use less light but more perspective and abstract lines to bring forth existential moods. If one wanted to find influences, perhaps Edward Hopper is where to look: both artists capture introspective moods by transposing emotions onto tranquil landscape, nautical and architectural settings. It was Hopper's teacher Robert Henri at the New York School of Art and Design who is quoted to have said that "it isn't the subject that counts but what you feel about it." Billowing white clouds are indeed a prevalent new element in Blom's work. In some pieces, his sunlit cumuli remain as quietly foreboding as Matisse's in La Malediction; in others, they appear as a wide open celestial playground for the spectrum of human emotions like Hayao Miyasaki's magnificent animations. Again one is struck by the ability of the painter to impress his subjective feelings onto an object that becomes a momentary carrier of emotion: split seconds caught on canvas to capture the viewer's attention prompting subtle self-examination. It is Blom's ability to paint emotional disposition so casually onto everyday objects that leave a lasting impression. There is also a new quality to Blom's most recent compositions of indoor scenes. His occasional insertion of random lines that confound the otherwise realistic composition adds complexity to his palette when exposing inner visions on the canvas. Further clues to Kenneth Blom's finely nuanced approach to appearance vs. abstract meaning can be found in his amusing series of shark paintings (also available in the artist's special graphic edition): four different shark portraits given names of prominent Norwegian art critics. These menacing creatures are exquisitely rendered in Blom's contemporary figurative style and coloring. The hidden meaning lies behind the realistic depiction, as in Picasso's Blue Period masterpiece series of young clowns, which in essence are self-portraits in disguise. In the 2011 "artist talk" with Nicola Kuhn of Berlin's Tagesspiegel at Maerz Contemporary's previous Berlin gallery location, the artist exclaimed, "it feels like I am painting the same painting all my life." It is left to the viewer then to discover the artist's newest variations on his theme. Born in Denmark, Kenneth Blom was raised in Norway and attended the Oslo Academy of Fine Arts (1990-1994) and the Düsseldorf Art Academy (1994-1995). His most recent solo exhibit Theater of Operations was held in 2016 at Pekin Fine Art in Hong Kong. Kenneth Blom is a featured artist at Sotheby's, London; he is represented in Oslo by Haaken and in New York by Jason McCoy. The artist lives and works in Oslo, Norway.